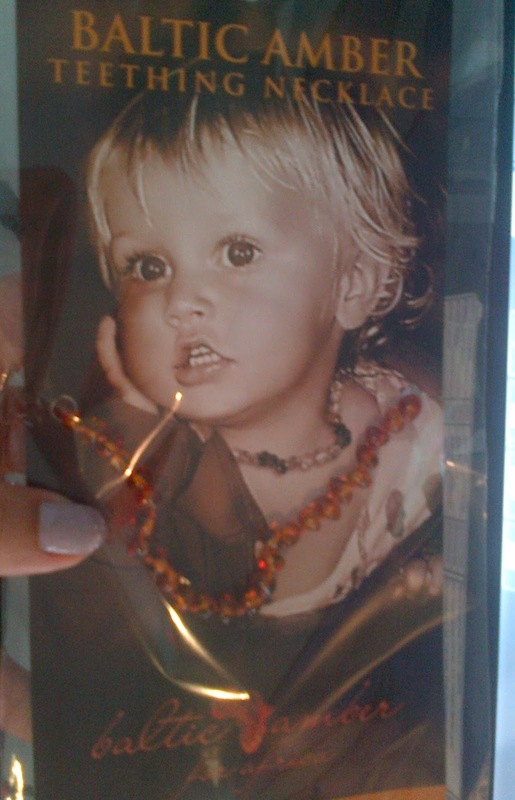 So, today, I went out and purchased a string of baltic amber beads for my Curlysue. Besides for the fact that the pearlys are right beneath the surface of the gum and they refuse to budge an inch further, she has also been drooling a lot, which causes an eina looking rash on her neck. She is so uncomfortable. And needless to say, sleep has eluded us for many a night now. And then I heard about the amazing amber beads. They are apparently made out of (duh) amber and it is said that this amber stone can help to boost the immune system, reduce inflammation and accelerate the healing of wounds. Many swear that they are perfect soothers for babies who are teething as well. I’m not sure about the healing properties of this here necklace and my hubby says that it’s “voodoo” but after reading up on it, I am willing to spend R195 and give it a go! Sounds worth a try, right? The nice lady at the shop I bought it from said to give it 4 – 5 days before it will take effect. I will report back in a weeks time to let you know whether this thing is worth the price of a pack of diapers!